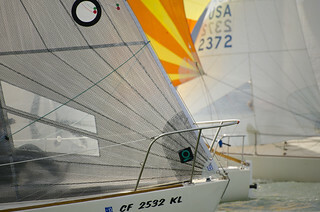 J-24 Fleet 17 offers the best in J-24 racing for sailors in the San Francisco Bay Area. The J-24 is one of the most popular racing boats around the world; it's a great boat to start your racing experience. Our regular season series features great competition for all levels of experience. Yes it’s the annual Crew You regatta. We have a few crew who are still looking for boats. So let us know if you’re short. 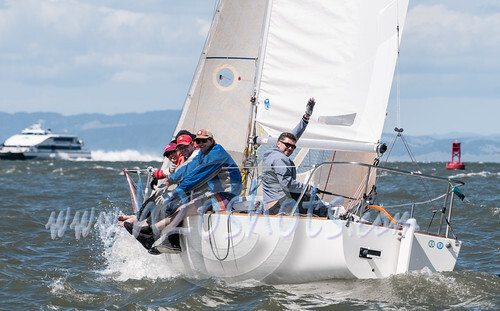 We solicited a few of the fleet skippers for their recaps and reports of the terrific and fun Small Keelboat Series, hosted by the San Francisco Yacht Club. Don’t miss the video from Randall showing not only the excellent conditions, but a special guest appearance by Dean Don! “A better Summer day for racing on the Bay, I can not conceive of. Cloudless skies, no fog, and south by southwesterlies never really making it to the 18 kts. mark. An organized and communicative race committee, great competition, what more could one ask for? 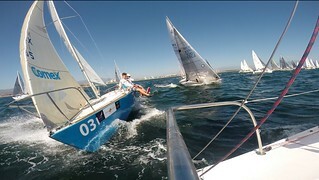 This was the scenario for our final set of races in the SFYC series of three. We went into the day one point behind Alex and “Fly by Night”, so our focus would mainly be on them. Though it would have been nice to take one or two away from Rich and “Rail to Rail’s” near monopoly on firsts. Was a little bit late on the first start, but still on top of a lot of boats, “Rail to Rail” in contact, but out in front. Stayed on their tail the majority of the race. We separate some from the others, but could not find the speed (or angle) to get past R2R. Race 2, saw some boats changing down to blades, but we were not seeing Karl at the Gate, so thinking the weird (for this time of year) southerlies were mitigating the big blow. We spun up one setting on the shrouds. Shadowed by R2R into the start by the committee boat. But, got an opening, pulling the trigger a little late again, put over a good portion of the fleet. Saw some boats stuck in a “second row” start. R2R out in front with a great start again. Val and “Shut up and Drive” made a tight cross on us. Maybe the pin was favored? Though the left paid off for us, and we stretched out a little, though out of striking distance on R2R. One above base felt a little slow here. 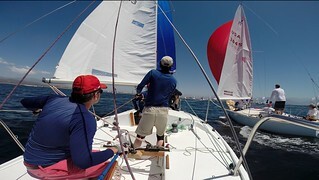 Final race, starting to feel a little more pressure, but the genoa still manageable. Again shadowed by R2R on the prestart. But, they peel off to start down the line. Hit this one pretty good, but on the first tack R2R is well ahead. Thinking we missed the shift here, and the pin-favor? FbN goes all the way out to the port layline, and are able to round inside of us (overstood). Good drag race downwind, we have the inside. Big shift from the South at the leeward side of the coarse. Slightly late and sloppy douse / gybe, and again FbN slip inside the open door. Try and split with them, but they are dialed in and sailing fast, extending by a couple boat lengths. Some might have thought Alex and I had planned to be Fourth of July patriots for day 3 of the SFYC Small Keelboat Fleet Regatta. To go with our similar names, both Flight and Fly by Night had identical red and blue spinnakers to go with our white boats. The truth goes a bit farther back in Fleet 17 history. Don Taylor always had red and blue spinnakers on On Belay and years ago Don gave one of his old kites to Val, last year Val gave it to Alex. With the forecast of 30 knots for the regatta Saturday, I decided to bring out the old double stitched red and blue kite which I inherited from Don when I bought On Belay and renamed it Flight 4 years ago. To add to the coincidence, Don Taylor was back trimming his old red and blue kite on Flight Saturday. Evil Octopus made the road trip to Long Beach for the famous LBRW regatta which happened to be our western regionals this year. Started off with a bang (aka bullet minus 1) and then whimper, moan, grunt and whimper. Great venue, but tricky to read the light and shifty winds. Great team, but first time really racing in these positions together. Big road trip, made more exciting when the trailer came detached 100 yds short of the freeway. And stiff Mt Gay cocktails, but not free. No excuses though, Evil Octopus is getting ready for Nationals in May. And many of these top tier boats are planning to be there. We were glad to have gotten a chance to cut our teeth some more. Here’s a vid of the Saturday night post party scene..
Here’s just something to brighten your day. Next spinnaker you buy better be colorful. The results don’t really reflect how close the racing was yesterday. The race committee was nice enough to move the race much further north than last time and the winds, though high, were manageable. The first race was mostly run with Genoas, but everybody switched to the blade for races two and three. Rich joined the fun and again schooled everybody. Thank you sir. Bring it on. Alex had his top crew out. He had great speed and we noticed how flat he was sailing his boat. Too bad about the faulty spin pole. Randall had an excellent first start and rounded the first mark in second place. However a booboo made him hit the mark and put him out of contention. Val was sailing with four up and given that handicap did extremely well. Especially on the downwind legs. Woof was also four up. Their Pan Am was the best choice in the first race and gave them a lot of height and speed. Darren was very competitive all round. Good starts, good speed and good crew work. Considering that he had two more skippers as crew (get your own boats out) it was amazing that their communication did not fall apart!. As for Evil Octopus, we were OCS in the first. Brushed up against an Etchells spinnaker with our windex in the second forcing a two turn penalty. Finally had a good race in the third. We decided not to hoist the spinnaker due to relatively new crew and old spinnaker. By our calculation we lost on average five boat lengths on the run, but made up one of them each time by having killer leeward roundings. By the way, the starts were extremely tight. This fleet is really good. Next month I would hope that some of us would be willing to sail over to SFYC after the racing for a drink and some awards. We sailed over there yesterday and got there before 4 pm. Six J24’s competed on Saturday in the first of three single day regattas hosted by the San Francisco Yacht Club and from our perspective is was a resounding success. As the video from Evil Octopus shows the racing was very close indeed. The wind was not too heavy until maybe the final race. But we had enough on our hands trying not to bump into eachother. EO hereby offers apologies to the fleet for clogging up the roundings with stalls, overrides, kite shrimpage, wipeouts and general mayhem. Thanks for not hitting us. A big thank you as well to all of you for letting us get a bullet on the last race. With Val out (broken gudgeon), Randall attempting the first leg without any headsail, Alex sailing with the genoa in over twenty knots, Darren sailing with undernourished crew and Wally starting late and deciding not to hoist we had a real chance at a medal, and we took it. Finally a special thank you to Jeff Zarwell for throwing up the AP flag just when we were pushed OCS by Woof and Shut Up. Most of us retired to the bar at Richmond YC because that’s where we keep our boats, but we should plan a trip to SFYC to thank them for all their help. Just one small request::::: Please please please with sugar on top put the racecourse a little further north. I’m sure the melges’s enjoyed the bigger breeze, but for us we need less of it. Two J24 Fleet 17 crews compete in North American Championships / Copa Mexico-Riviera Nayarit, Mexico. Thirty-seven crews representing Mexico, the United States, Brazil, Peru, Germany, Italy, Monaco, and Sweden competed for honors in the J24 North American Championship / Copa Mexico, March 18-21, 2014. The event was hosted at La Marina Riviera Nayarit de La Cruz on beautiful Banderas Bay, near Puerto Vallarta, Mexico, Nine races were run over the 4 days of the event. The United States’ Mike Ingham on Digger and Tony Parker on Bangor Packet took the top spots. Two crews from San Francisco J24 fleet 17 represented Northern California, with Randall Rasicot’s Flight finishing 30th overall and 21st for the North America’s Championship while Val Lulevich’s Shut Up and Drive finished 16th overall and broke into the top 10 with a 9th place showing for the Championship. The natural setting of Banderas Bay is beautiful, and no wonder it is considered one of the prime sailing destinations in the world. A marine protected area, the Bay is a breeding ground for humpback whales, which were congregating in the Bay in preparation for their migration north. Whales regularly surfacing among the boats on race course added some unusual majesty to the competition. The fleet 17 crews, used to often windy, and cool weather of San Francisco Bay, were delighted by the warm and mild racing conditions typical of Banderas. Weather patterns were consistent throughout the week, with temperatures in the low 80’s and breezes between 5-16 kts. A typical day saw calm morning blowing from Punta Mita, and then backing to the south while increasing steadily into the afternoon. With three races scheduled for each day, crews most competitive in either light winds or heavy winds were both able to find advantages throughout the day, keeping the racing tight. Conditions weren’t always typical. Winds gusting near 18kts in the afternoon on days 2 and 3 allowed the San Francisco crews to shine. A number of substantial wind shifts throughout the week also kept the race committee busy resetting the weather marks between legs. A notoriously large shift in race 5 shook up the point spread as boats that rounded the leeward mark late in the 1st leg were surprised with a tidy gain heading to the new weather mark. Shut Up and Drive moved from back of the fleet to a remarkable 13th place finish because of this particular adjustment. Many highlights of the week occurred off the race course, as competitors enjoyed the hospitality of the Marina Riviera and many sponsors. Tim Healey of North Sails provided an informative post-race debriefing on his techniques for trimming and tuning up for each day’s conditions, along with free beer. Competitors were treated to a lavish welcome party with buffet and cocktails at the Marival Resort on Sunday before the racing began. Hearty post-race meals were provided by Jaguar of Guadalajara and Volaris Airlines at La Marina Riviera yacht club. La Marina also hosted a wonderful beach-front awards ceremony, complete with a feast and live entertainment that kept some crews dancing all night. The Brazilian teams may have stolen the show, as boats returning on day 3 were greeted at the docks by samba dancers and caipirinhas, followed by food, live music, and carnival games. The crew of Flight includes skipper Randall Rasicot, Melissa Litwicki, Jessica Ludy, Michelle George and Jasper and Robin Van Vliet. The crew of Shut Up and Drive includes skipper Val Lulevich, co-owner Zane Starkewolf, James McConaghie, Alex Schultink and Vince Benvin. 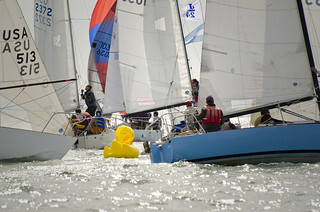 Saturday is the start of the SFYC small keelboat series. We have six boats signed up so far. The series is specifically designed to encourage new racers to try their hand. It’s only a one day commitment. The racing will be on the Southampton Shoal side of the Berkeley Circle in order to avoid some of the stronger breeze. We hope you come out and play. In the meantime check out this shot of Val and the crew on their way to winning the division on Saturday at the Great Vallejo race. Failing any written reports or photo’s from the two Fleet 17 teams on their spectacular results in the CopaMexico/North American Championships we are publishing these two shots of some of the post racing fun. First are the bruises incurred on Flight by Melissa, Jessica and Robin. Second the odd places sunburn occurred on James, Val and Zane. Small price to pay.